Hi, I'm Elspeth and I'm excited to share This fun Little Project with you! I have too many baby clothes and not enough doll clothes. We won't be needing these baby clothes any time soon, and they are taking up a lot of storage room. 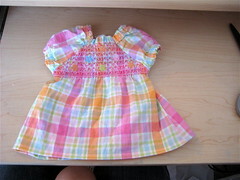 I decided to turn a 0-3 month baby jumper into a dress for my daughter's baby doll. I've been reading a lot of refashioning blog posts and always find it easier and safer to do for my kids rather than for me. 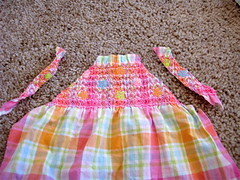 If you haven't tried refashioning yet, starting with doll clothes is a great way to start because even if it doesn't turn out the way you planned, it will still get used. This Little Project took me a little less than an hour to do with my two little helpers "helping", so it would be an easy project for someone with sewing experience, or a great first try for beginners. 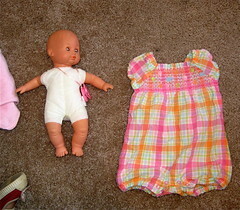 When turning your baby clothes into doll clothes, and when refashioning in general you won't be using a pattern. Before cutting spend a minute looking at how it's put together. You'll want to cut along the seams, cut the pieces down keeping the angles the same, and sew them back together. 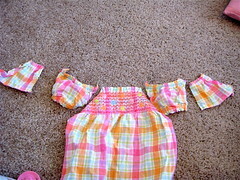 I included a lot of pictures, not because you're baby clothes will be the same, they probably won't, but to show you the process so you can try it. Here is my before and after. 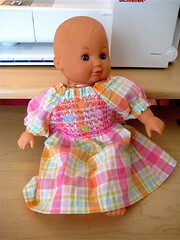 I started with a pretty standard 12 inch baby doll and a 0-3 month baby jumper. 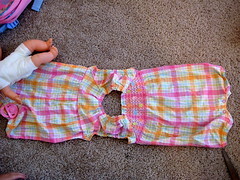 I would stay near the smaller end of baby clothes as it can be harder to resize if the clothes are significantly bigger than the doll. I cut up the side seams and then cut off the back at the bodice. 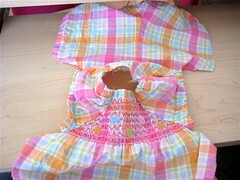 I then cut the sleeves off and cut them in half so they would be about the right size for the doll. 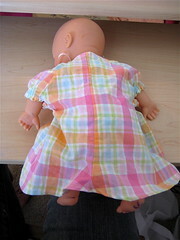 The front of the dress was too big, so I cut it down so that it would fit the doll. 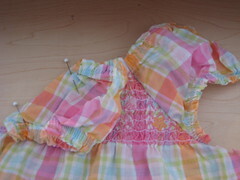 As you are cutting different pieces down to fit your doll, you want to keep the lines and angles the same so that the pieces will all fit together again when you sew it back together. I cut the back piece out to the match the front. I sewed the sleeve onto the front of the dress by putting right sides together and then sewed the sleeve onto the back piece. 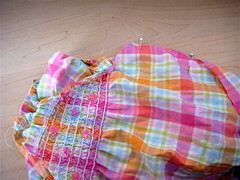 Putting right sides together, I sewed the sides together and cut off the bottom and hemmed it. When you're done you'll have a new dress for you doll! 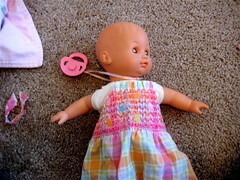 I enjoy seeing my daughter dress her doll in an outfit I thought was so darling on her. I Found that a lot of newborn or 0-3 clothes fit the dolls just fine, particularly if they're the 18" dolls or Cabbage Patch kids.